Linux Curl command is very amazing. It’s very simple command which is use to send or get data from and to any server. Server would be any server like end point URL, ftp endpoint, etc. In this tutorial we will go over how to read file line by line and then perform curl operation to get HTTP response code for each HTTP URL. Put below URLs into file and save file using command vi crunchify.txt to create file and :wq to save file. Execute below command to get result. If you want to see detailed result and response just try adding -v into curl and you will see detailed verbose result in command prompt. Here is an updated command. 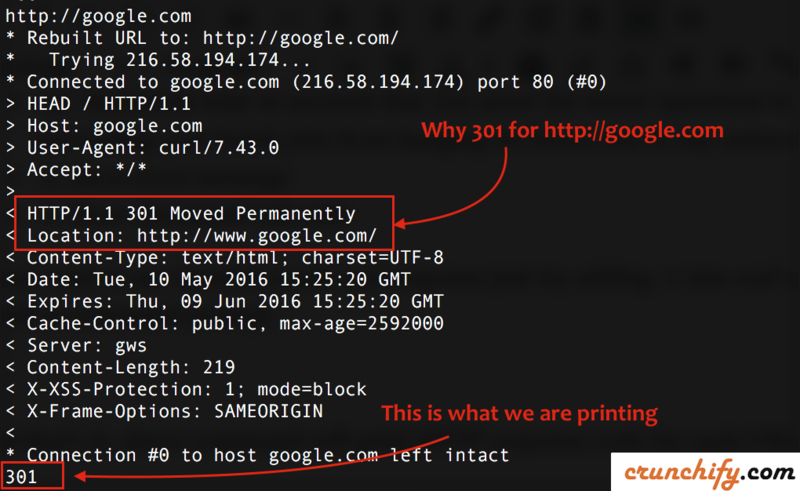 And that’s it, above command will print HTTP response code for each URL. bash – Execute a command once per line of piped input? How to Implement Linux PING utility command in Java?